Assuming you are having tables for a sit down dinner, your wedding centrepieces will be positioned in the middle of the tables and will form the focal point of your wedding decorations. While flowers are the traditional choice there are plenty of other options so check out these wedding centrepiece trends. Making your table numbers prominent and easy to read will assist guests in finding their seats as well as looking great. Brides are making ornamental table numbers out of a variety of materials from twisted wire and beads to painted foam. Creating a decorative 3D table number and placing it in a simple flower arrangement is a very popular table centre option. Try making a black and white photo strip displaying all the guests on one table, and use it to create a simple shade which you can put on a battery powered lamp at the centre of the table. Alternatively how about a table centre tree with framed pictures of the guests hanging on the branches? Designing the table centres after you have finalised your seating arrangements gives you the chance to personalise your centrepiece to the guests at each table. Centrepieces need to be positioned so guests can still see and speak to each other from either sides of the table. Transparent containers are practical as they allow light to pass through, and some brides decide to suspend arrangements such as birdcages from the ceiling so that they are not obstructing the guests who are holding their conversations underneath. Keeping the sight lines clear can mean having low arrangements, or very tall ones with narrow vases or candelabras. Couples are looking for quirky objects to put their flowers in, such as flowers and vines twisted around a vintage musical instrument like a French horn or white roses placed in an oversized pink tea cup. 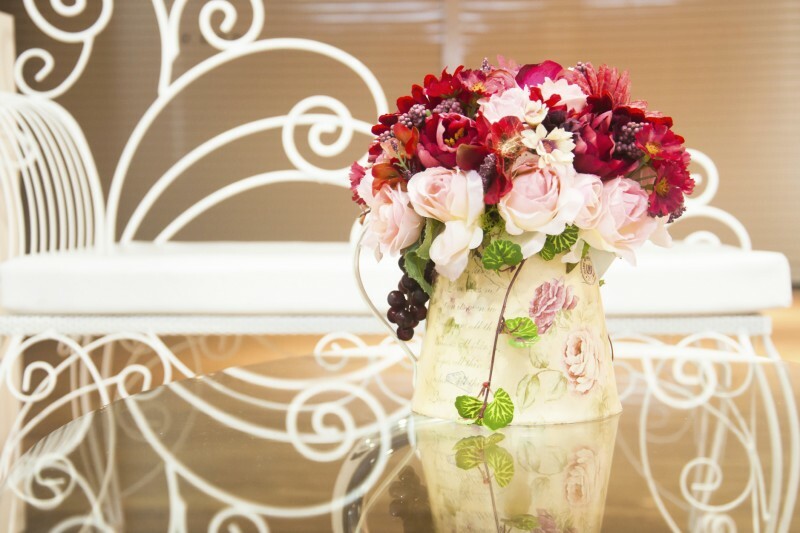 While flowers are still the primary feature of many table centrepieces, more emphasis is being placed on the container they are displayed in. For those that want to retain a table centre, a tower of macaroons, a dish of fruit, or a bowl of chocolates can all make effective centrepieces. With wedding catering becoming increasingly sociable, and banquet style wedding dinners coming back into fashion, many couples are deciding to do away with centrepieces altogether to make room for food. Platters, sharing plates, and bowls for dips and sauces can all be placed in the centre of the table. Instead of having a single wedding cake displayed on its own table, many couples are choosing to have several smaller cakes made, and to distribute one on every table as a delicious wedding centrepiece. The cakes can all be identical, but this trend works best when either the colour or the design is slightly different for each table. The table names can link to the colour or style of the cake. Static traditional centrepieces are being replaced by arrangements that have flow and movement and asymmetric centrepieces are also very fashionable at present. 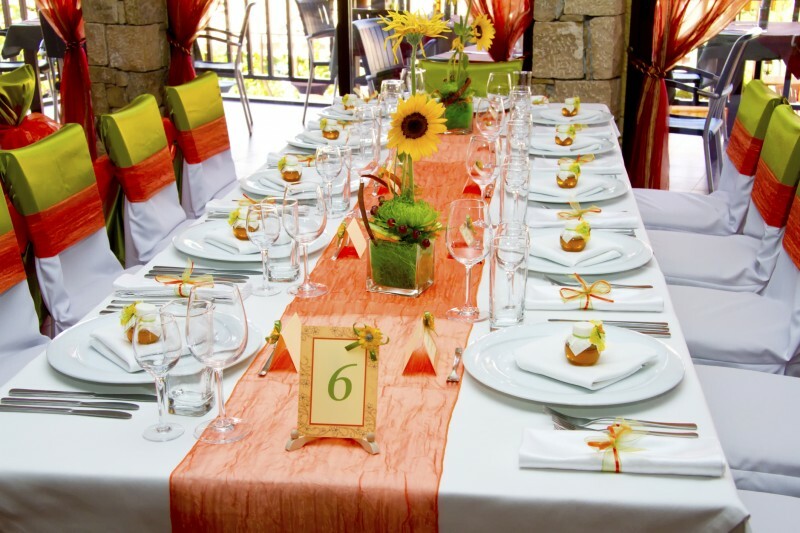 Tall arrangements are constructed to allow the tallest parts to move from side to side if there is a breeze and floral centrepieces are being designed to cascade down the side of the table and all the way to the floor.